The Leaders all do their very best to keep costs as low as possible. Subs are paid quarterly and are £26.50. We currently have quite a long waiting list for Beavers. When we have spaces for new members, we take the child who is next on the list. If you are the parent of a young member who would like to be added to our waiting list, please click on the join us page in the navigation bar above. Were always on the look out for new helpers to come and join in the adventure. If you think this could be you, find out more on the Adults page or Contact Us. 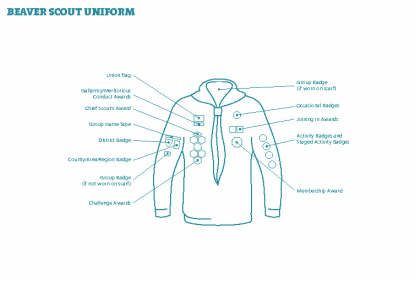 Check below to see where badges are worn or see the sign in the HQ main corridor. Want to know when your child is moving up to the next section? We try to make scouting as affordable as possible. Financial hardship should not prevent any child from being a full part of our group. We have an agreed fund that is available to support families who are experiencing hardship. Please speak to your section leader in the first instance.